Some of you may have wondered how Steve was doing in his recovery. I want to share with you a very touching 8.5 minute video, titled “‘Nanicabo’ (Family).” It shows Steve during a recent visit from Mincaye and his wife. Mincaye is the former warrior who was one of the murderers of Nate Saint and the other missionaries, and who later came to faith in Christ. 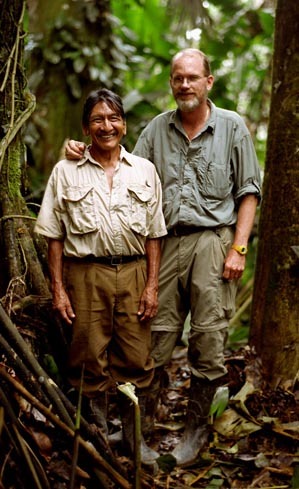 Several years ago Nanci and I spent an unforgettable day with Steve and Mincaye. I interviewed them in three church services, then spent the afternoon at the home in Portland where Jim Elliot grew up, with members of three of the five families of the murdered missionaries. And they sang a new song, saying, “Worthy are you to take the scroll and to open its seals, for you were slain, and by your blood you ransomed people for God from every tribe and language and people and nation (Revelation 5:9). We won’t all, in this life, meet someone whose story will suddenly shed light on God’s purpose in our loved one’s suffering or death. But I think most of us will have that very experience one day on the New Earth. Some years ago Steve Saint and I became friends. He came to our church within a week of the 50th anniversary of the death of those missionaries, and I interviewed him and Mincaye, the former warrior who was one of the murderers of the missionaries, but who later came to faith in Christ. On January 8, 1956 five missionaries were murdered in Ecuador: Nate Saint, Jim Elliot, Ed McCully, Roger Youderian and Pete Fleming.